Watch out Southeast Division. Here come the Washington Capitals. The Capitals' defense played the biggest role in Alexander Semin's return by keeping him and his team mates off the scoring sheet while added a pair of big goals to boot. The Capitals chase the division leading Carolina Hurricanes out of Verizon Center with a convincing 3-0 win giving Braden Holtby his second shutout of the season. Nick Backstrom scored his second goal of the year on the power play. It was a tip-in right in front of the net. He would add an assist on John Erskine's goal, his second of the year as well that made it 2-0 in the second period. 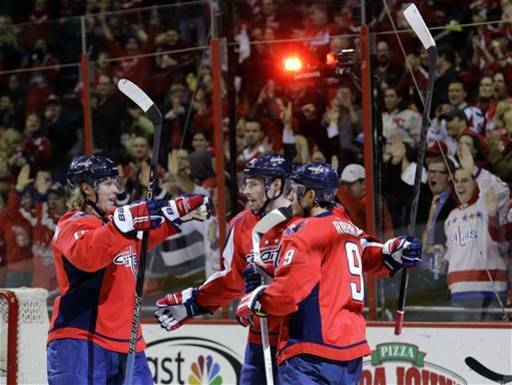 Add a John Carlson goal off of a big Cam Ward rebound and the Caps win their second in a row. The story of the game was all about the Caps defense. After signing a two year contract, John Erskine looked like he would reward his team for the opportunity to stay a Cap. He scored a big goal in the second period as Nick Backstrom pulled up to hit the trailing defensemen. He got all of the puck on his one time slapper and Erskine gave the Caps their two goal cushion. Erskine finished the game with a goal, three blocked shots, and he absorbed a boarding check to give his team the power play in the third period. A pretty solid game from the big blonde. Of the Capitals 40 shots on net, 10 came from the Caps' defensemen. It would take a team defensive effort to keep Semin from the getting on the score sheet in his return to the Verizon Center since signing with the 'Canes in the off season. Troy Brouwer did a phenomenal job keeping him at bay. Mike Ribeiro contributed not only with an assist, but had five blocked shots. The forwards pitched in where they could, the defense held their ground and Holtby was there to clean up the rest. Braden Holtby was there with some solid stops, even stoning Semin streaking in on a break away. Holtby would face down all 33 shots that came his way for his 5th career shutout. His calming demeanor meant he was seeing the puck well, squaring up to the shooters, and that glove of his was lightning quick when it needed to be. Holtby's save on Semin was pretty awesome, but Cam Ward came away with the steal of the night. Ward left a sloppy rebound in the slot off of a Wotjek Wolski. Joel Ward streaked in and shot it at the open net, but Cam Ward pushed his glove out at the last second to steal a would be goal from Joel Ward. It fooled the horn guy and the lights guy. Could be the save of the year by Ward who was on top of his game. It was a shame none of the other 'Canes showed up. There were long stretches in the first and second periods were the Caps were just dominating the Hurricanes. A ten minute stretch in the second was the best net minder Holtby had seen since joining the team. They worked as a five man unit moving the puck and creating scoring chances. The Caps played probably their best 60 minute game of the season. They will need a repeat performance when they travel up to Philadelphia to take on the Flyers tomorrow night. This marks the first time this season the Capitals have had 40 shots on net. Alex Ovechkin had zero. He had a shot ring off the post and missed on another shot. It is the first time this season he has been held to no shots on net. Losses tonight by Tampa Bay and Carolina, the Capitals move to within four points of the lead in the division. Head coach Adam Oates was tight lipped about who would be in net tomorrow night against the Flyers.